There will be 11 total skeins of yarn this year, more than any YAL year before. The total sign up price for the YAL is €335 for shipments within the EU + shipping or €276.85 excluding VAT for shipments outside of the EU + shipping. Subscribe to our Newsletter and follow us on Instagram as we reveal this year's YAL dyers leading up to the March 13 sign up date. 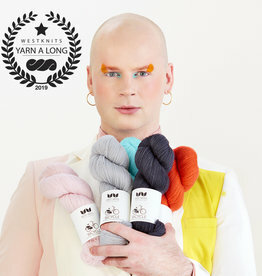 Join the West Wool Ravelry group for this year's West Wool KAL's and YAL discussion threads. Please read our FAQ to find answers to all your Yarn A Long questions.